Adobe Flash Player 11.1 has been taken down from the Google Play Store as Adobe announced that they would be discontinuing the Flash player for android, starting from 4.1 devices. Fortunately, an XDA forum member stempox come up with a small guide to install Adobe Flash Player. Now you can easily and safely install the Flash Player on any gadget with Jelly Bean. It is advisable to be on a better side before start to try anything newly on your device. So backup your datas which was present in your phone before start to proceed. And also charge your battery fully; if the battery is low there is a chance to turn off your mobile during the process. Disable the all antivirus tools in your device because this may interrupt the process. Initially, you have to download flash player from here to your computer. 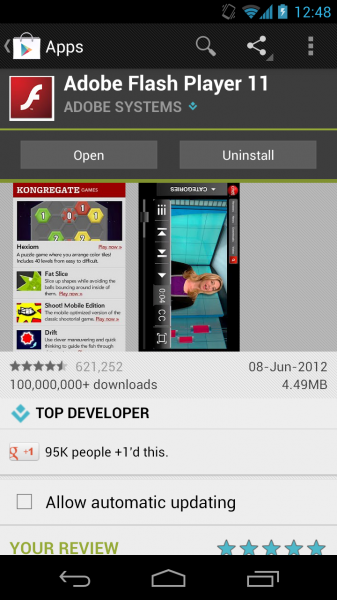 Secondly, you have to download the dolphin browser HD 8.5.1 APK because Chrome does not support the Flash. Now,copy your files to the SD card of your Android device. Once you copied, then install the same using any File Manager. After that start to Browser go into the browser settings and uncheck the option of Flash Player. That’s it, the flash player app is now installed on your android device.